This summer, 5690 broke from her usual pattern of nesting on the beaches north of Lahaina boat harbour. For her second nest, she crawled up on at Wahikuli Beach Park, which is north of Lahaina and closer to the famous beaches of Kaanapali. It wasn't a particularly good choice because at high tide, there is almost no sand that isn't underwater or washed constantly by waves. There was some confusion about the actual first emergence from this nest. It was thought that this could have happened on Wednesday night or Thursday morning, but numerous crab tracks and the tide had made it impossible to be sure. Glynnis Nakai of US Fish & Wildlife Service, the federal agency responsible for the nest, had been kept informed of the nest's progress. Standard procedures call for excavation 72 hours after a nest has hatched, so to be safe she decided to dig on Sunday evening, July 18th. We checked the tide charts and immediately spotted the first problem. The nest would have to be excavated right at high tide. When we arrived, a crowd had already gathered, tide lapping at their feet, and Glynnis was about to start. 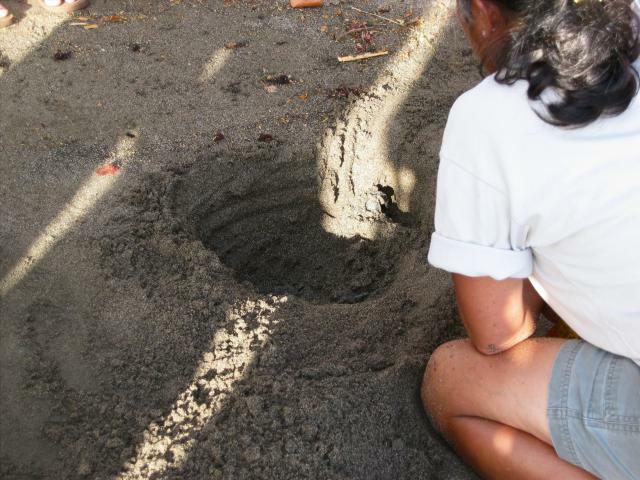 It was clear where to dig because hatchlings had been seen emerging the previous day. Sure enough, she'd barely begun when she encountered a wriggling little turtle. The crowd cheered! A hatchling had been saved. Well, since it was so close to the surface, this one was probably in no danger, but people felt jubilant anyway. Almost immediately, Glynnis found another... and another. Almost immediately, Glynnis found another... and another. All alive. A little more digging revealed that a good portion of the clutch had been still slowly making its way up towards the surface. Now the issue was confused. Glynnis wisely decided to halt the excavation and cover the hole with a cloth. This would protect the hatchlings from the sun, which was still setting, and provide some time to decide how to proceed. Nature, however, is contrary by, well, nature. Moments after the digging stopped, a set of large waves rolled in and washed the whole nest. The excavation was flooded! Glynnis immediately asked the onlookers to build a sand dam and quickly resumed the excavation. This was not because the hatchlings might drown. They were, however, at risk of being swept away and scattered all over the beach. The sun was still high enough to pose a danger to the little creatures, who are so small they could quickly overheat, and who would be immediately disoriented by the bright light. 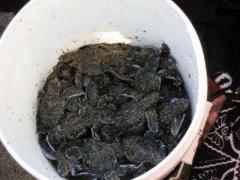 So the excavation continued, and the bucket that was intended to hold one or two stragglers wound up holding... a lot of little honu. A lot of little honu. 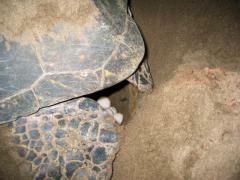 In all, Glynnis found 19 live hatchlings. 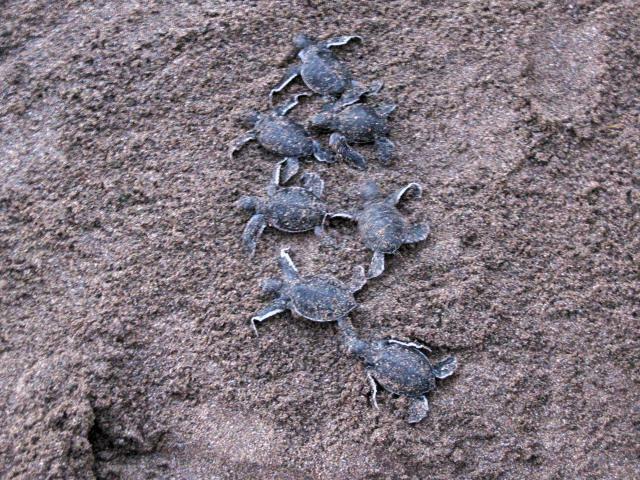 These were kept covered until just after sunset, when the appreciative crowd of turtle enthusiasts were treated to many more hatchlings rushing down the beach than anyone had anticipated. The circumstances were slightly unusual, but it was almost like seeing a nest actually erupt! There was a much larger hatchling rush down the beach than anyone had anticipated. In the end, the early excavation of nest 2 turned out to be a good thing. Because the nest was constantly washed by waves, the sand was being compacted. This made it much more difficult for the hatchlings to dig their way out. How many would have eventually gotten away on their own will never be known, but all concerned concluded that the excavation had been the right thing to do. Our last real kayak outing was July 20th. It was a beautiful morning for it, with no swell and no trades blowing. We were so bold that we decided to make a long trip in what would normally be the downwind direction. We knew there was a reef down there with turtles on it. Many people had told us about it. One of the hotels in that area had a dive operation working out of it that took people out to see the honu. 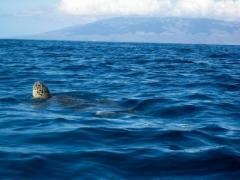 We therefore knew that some, probably many, of the turtles they were seeing were honu from our ohana. The kayak and the calm morning offered the perfect chance to go and see what was up. Thanks to our new-found fitness, the trip there was a piece of cake. We sat around for perhaps half an hour, spotting occasional shells at the surface, seeing some turtles through the water on the reef below us, and even detecting some SCUBA bubbles a couple of times. 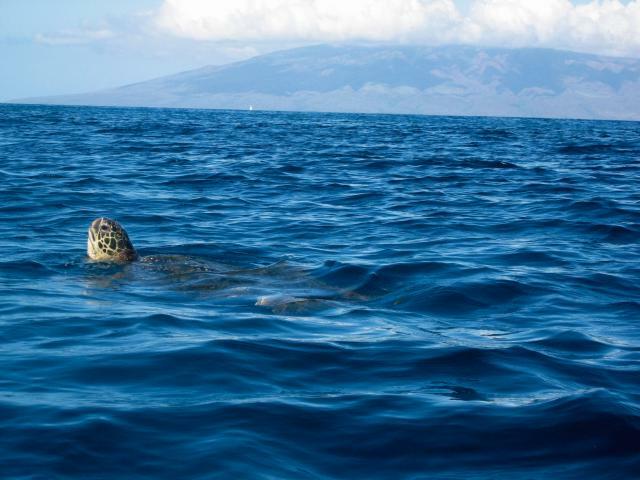 Unfortunately, none of the honu who surfaced showed enough of their profiles to be clearly identified. Oh well, we tried, and we learned something: the action there was no match for what we saw daily at our own Reef 2. So we hastened back up to our own reef, and were soon treated to a steady parade of honu coming up to breathe. They were particularly active that morning. 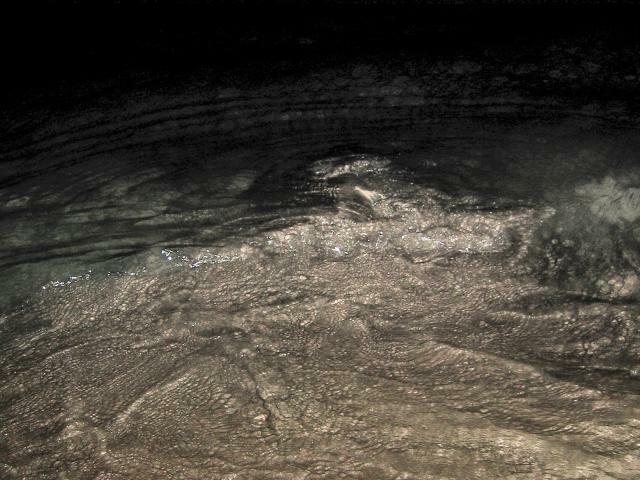 In one incredible burst that we probably won't see again this summer, we counted 15 turtles on the surface. Why this would happen is a mystery. The only other time we've seen something like that was when two strange divers showed up and went out and found the turtles. We weren't in the water, we were watching from shore, but it was clear when they got to the turtles because about a dozen shells came to surface at once. The strangers had no clue how to act around honu. This time, there were no clumsy divers to blame, however. We relaxed and enjoyed the show. We kayaked a long time, longer than normal. Little did we realize what a price we'd pay later--especially Peter. More on this to come. This image brought to you at great cost. Read further. On July 19 it had been 13 days since 5690 had nested. Maui's turtle mother was due for another drop and this time we'd be ready! No more thin clothes so we shiver and shake. No more no food so our stomachs grumble and churn. No more only one bottle of water. No more looking like complete idiots! Most importantly--no more feeling like complete idiots! We brought it all. Sandwiches, peanuts, nectarines. Not just bottles of water, but also two small plastic bottles in which we poured two types of very cheap wine! We brought towels. We brought spandex suits for warmth. We even brought toilet paper of sorts. Best of all, we brought our kayak--for a comfortable place to sit and lie down in. This time we were prepared! We launched from the beach. We watched the sunset and paddled up and down the length of coast looking for 5690's signature turtle tracks. No go. We stayed until past 11 PM, and still she hadn't crawled. So we took the boat out of the water, gave thanks for a lovely evening, and went home resolved to try again the next night. Fast forward to the evening of July 20th. We'd kayaked that morning and made one dive in the afternoon. We were pooped but we knew we had two things in our favour. One. Mary Jane Grady would be there. Two. Should we completely poop out, we could sleep in the kayak while Mary Jane babysat 5690. This time, we decided to wait until 9 PM before arriving on site, believing that 5690 wouldn't crawl up earlier than that. We got to the beach, slipped the kayak in the water, and got perhaps 10 yards out when Peter looked back through the darkness at the shore. Guess who was crawling up? So it was back to the beach (cautiously a good distance away), pull up the kayak, and go and check on the turtle. Before we got there, Mary Jane Grady stepped out of the shadows and told us that this was 5690's third crawl of the evening already! We should introduce Mary Jane. Mary Jane Grady and 5690 go back a long way (although not quite so far as 5690 and George Balazs). Back in 2000, the first time someone spotted 5690 digging on the beach in Lahaina, it was Mary Jane who got the call. She was quickly on the scene, and she alertly spotted the tag that gave 5690 her offical name. Being a smart turtle person, Mary Jane knew when it was safe to approach and read the tag, which she then reported to George. The rest is history, as they say. 5690 is, in a certain way, Mary Jane's turtle. Mary Jane has been a reliable and knowledgeable turtle person and we've sort of come to expect her to take charge of things like 5690 nestings. Take charge she did. In her quiet, attentive and competent way, Mary Jane monitored every aspect of 5690's nesting effort that night. What a luxury it was for us to lie back (quite literally, in the kayak) and have Mary Jane do it all. We still expected a long night but it promised to be an easy one. At least for us. To our complete surprise, 5690 got down to business quickly. There wasn't the torturous fuss from her previous nesting. She'd settled into digging at a spot close to four of her previous nests. Shortly after midnight, Mary Jane confirmed eggs. We figured the cover-up would take a couple of hours and then we could be home in a real bed by 3 or so. Peter was complaining about feeling cold. He put on more clothes and then lay in the kayak and covered himself with a towel. 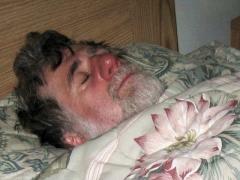 He still complained of feeling cold, and now he was feeling nauseated. He also added a headache to his complaints. The cover-up seemed to take forever. Ursula fell asleep in the kayak but Peter was far too uncomfortable. We'd glance in the direction of 5690 and the gusts of sand she flung and saw Mary Jane sitting protectively in the shadows. At one point three young drunken couples (cheering the abundant availability of cheap drinks from a local bar) ran up to a nearby tree and shed all their clothes. It's doubtful they knew they had "company." Then they braved the water and went skinny-dipping. We both pondered stealing their clothes or at the very least sneaking up with our camera and FLASH! taking a picture, but the six soon tired of the water. Ursula watched all this intently. She's able to confirm severe "shrinkage" on the part of all three males as they left the ocean. By this time, Peter was feeling even worse. Ursula could read his discomfort in his voice. Perhaps it was best to leave. After all, we weren't needed. Mary Jane had it all under control. Peter wouldn't leave 5690, however. He needed to see her safe return to the ocean. So stubbornly he stayed. 5690 continued her cover-up. Like a good honu mother, she carefully and thoroughly disguised her nest, and at 3:22 AM she was back in the water and gone. At 3:22 AM she was back in the water and gone. Peter felt so miserable that we picked up our kayak and left without even saying goodbye or thank you. So we want to do that here on Turtle Trax. We want to thank Mary Jane Grady for the classy and protective way she deals with Maui's special honu. We were a bit shocked to discover that she had to drive over from South Maui to do so. Now that's dedication. Sadly for Maui and Hawaii, Mary Jane is off to the mainland shortly to resume her education. The Islands are losing a valuable turtle asset, but we don't think it's permanent. If things work out, she'll be back to work with the honu again. On the way home, it was obvious something was wrong. Peter had a headache. He had muscle aches. He was cold and shivering, but he felt hot. Classic signs of a flu, we thought. Get home, get to bed. That was the plan. We slept until well past noon. WHen we finally woke, Peter was worse. We weren't sure what it was, but one thing we did know. He'd somehow forgotten to put sunblock on his nose before yesterday's kayak outing. It was lobster red. This seemed secondary to the other symptoms, which now also included severe nausea. We thought it might improve, but instead it got worse. By sunset, he was clearly running a high fever. Ursula (the female) insisted on going to the doctor. Peter (the male) resisted. He was weakened, ravaged by sickness. He lost. To the doctor we went. The doctor, a charming and efficient lady, told us that Peter had a fever of 102, which she called "impressive." She diagnosed a viral infection and prescribed an antibiotic, a painkiller, and something to battle the nausea. She noted the bright red nose but failed to make a connection. By now you, the intelligent reader, will have deduced that she should have. To show you what she overlooked, we are offering this picture. This is at considerable embarrassment to Peter but he agrees that it is part of the price for forgetting to use sunblock on his nose. You should know that this was not taken at the peak of its glory. Later, the proboscis not only swelled to nearly twice its normal size, the swelling spread into the eyes. Rudolph, eat your heart out. It turns out that a little research on the internet provided the correct diagnosis: sun poisoning. The symptoms are identical to a severe virus infection and so is the basic treatment, so the doctor did no harm. Recovery is proceeding slightly better than expected. Although the nose is still somewhat larger than normal, it is no longer of the heroic proportions seen above. Nor is it as red, having now attained a mottled off-red colour, with brown spots and the texture of Granny's best butter pastry. Surprisingly, it is not tender. Perhaps all the nerves have been roasted. Time will tell. Meanwhile, we have not been on the kayak or dived with the turtles for four days... and counting. No diving, no sighting. Alas.